March is National Social Work Month and a time when we busy social workers can celebrate our profession. This year’s theme is “Social Workers. Leaders. Advocates. Champions.” The theme could not be more fitting. In this capacity, for generations, social workers have helped individuals overcome challenges so they can live up to their full potential. Social workers also work tirelessly to improve our communities and society. They comfort people who are experiencing devastating illnesses and mental health crises, ensuring they get the best care while on the road to recovery. They support our brave military personnel, veterans and their families. Child, family and school social workers stand up by protecting children who have been abused or neglected, helping children find new families through adoption, and ensuring young people reach their full academic and personal potential. Social workers are needed more now than ever, as our nation continues to grapple with issues such as income equality, environmental change, the need for health care and mental health care, a national opioid addiction crisis and the continuing push to attain equal justice and treatment for all. Yet, this Social Work Month is a bittersweet one. 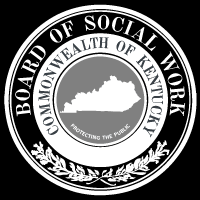 As I write this, we are in a battle to preserve the effectiveness of the licensing board overseeing our profession, the Kentucky Social Work Board (BSW). We are raising our voices in opposition to House Bill 465, which would undermine that effectiveness. The bill would combine the BSW with eight other professional licensing boards under a single authority that would oversee its operations. Consequently, all nine of these boards would be required to share a single staff and other limited resources to carry out their duties. In Kentucky, as in the United States as a whole, licensed social workers comprise the largest group of mental health care providers. In Kentucky alone, there are more than 5,500 active licensed social workers at all levels of practice. It is critically important to ensure the availability, competence, and ethical practice of these providers, so that residents of the Commonwealth receive the quality mental health care they need and deserve. The best way to accomplish this is by assuring that the BSW has at its disposal adequate numbers of experienced, seasoned and competent staff – whose time is dedicated exclusively to the unique mission of the BSW. The consolidation of the BSW along with numerous other boards under a single authority will undermine continued progress in these areas; consequently, it will harm mental health consumers. The BSW has made great strides within its areas of responsibility. For instance, it has helped assure access to services by increasing the numbers of licensed social workers through effective and efficient processing of licensure applications; improved competence by enhancing our continuing education requirements and program planning; and maintained ethical practice through its effective handling of consumer complaints. Indeed, the ethical oversight function – which holds the profession accountable for such issues as abuse of client relationships and breaches of confidentiality — is particularly important. Social work clients want and deserve assurance that strong standards regarding ethical and competent practice will be followed. Absent such assurance, people with mental health issues will be reluctant to obtain the treatment they need or may not benefit from the treatment they receive. The consolidation of the BSW along with numerous other boards under a single authority will undermine continued progress in these areas; consequently, it will harm mental health consumers. One immediate result will be that some current experienced and dedicated staff will be removed from BSW service. Staff lacking experience in social work practice issues — and whose time is diverted by the need to address a range of other disparate issues imposed on them by the other boards they will need to serve (including, for instance, the Boards of Dentistry and Podiatry) — simply cannot be relied on to effectively support the execution of the duties currently being performed by the BSW. However, we must credit the bill sponsor for graciously filing an amendment to the bill that partially addresses this concern – it requires that at least one individual serving the BSW have a minimum level of relevant experience. Unfortunately, this amendment does not go far enough. We believe that the bill’s approach to administration fails to adequately account for the immense and complicated nature of overseeing the social work profession. At the very least, we urge the Senate, when it takes up the bill, to amend it so as to provide the BSW with its “own” dedicated authority, with its own dedicated staff and resources – so that it can retain the independence and resources it needs to succeed in its critical role.